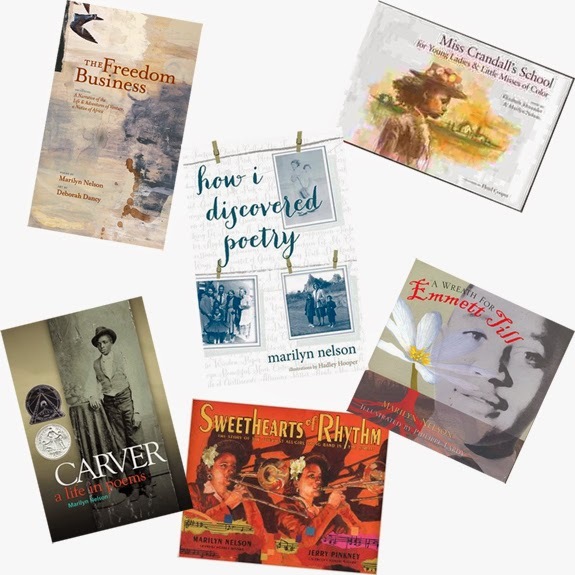 Earlier this summer and then again last week, I was reading Marilyn Nelson's newest book how I discovered poetry (2014). I really enjoyed it, as I have so much of her poetry over the years, including Carver, a Life in Poems (2001), A Wreath for Emmett Till (2005), and Miss Crandall's School for Young Ladies & Little Misses of Color (2007), which she co-wrote with Elizabeth Alexander. Nelson's work was actually important to the directions my collection of contemporary poetry would take. Her book Carver served as a crucial connector, prompting me to search out various other related poets and works. I'm looking forward to reading and re-reading more of Nelson's volumes.